Friday 18th of May 2018 – Capitol Nightclub Perth. 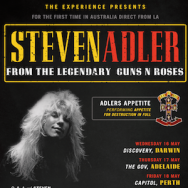 Former GUNS N’ ROSES drummer & co-writer STEVEN ADLER ignites his ADLER’S APPETITE! This unique experience will feature a Q & A, with Steven and the one and only Adler matriarch, Deanna Adler. She is a steadfast supporter & author of “Sweet Child of Mine: How I lost My Son to Guns N’ Roses”. During the last quarter century, Deanna Adler kept her diaries, journals, and personal letters, as well as a dozen scrapbooks and hundreds of photographs, putting them aside for safekeeping. This is your opportunity to experience the rare personal and emotive journey about raising her son, and the efforts of keeping him alive and herself sane.